An evolution, of the modern cricket shoe - incredibly lightweight, supportive and full of performance enhancing technology. 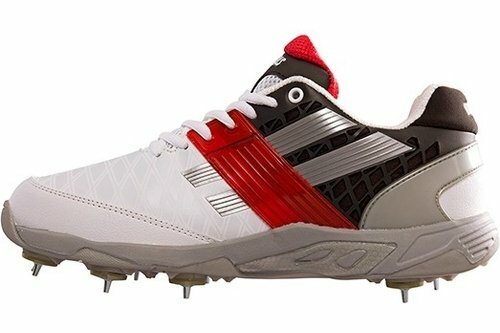 A shoe built for test cricket. Upper: DIAMOND Peform Micro Upper: Lightweight, breathable upper with micro injected moulding to provide support to the foot. Upper: POWERBAND BRACE PRO: Brace system which wraps around the midsection of the foot providing lateral support for explosive movements. Upper: PRO Heel Fit: Shaped TPU heel counter provides support and makes for smoother transition during running stride. Internal: Impact Protection System PRO (I.P.S. ): Smart impact absorbing layer of foam, which absorbs impact energy - Breathable, antimicrobial and lightweight. Internal:HAIPOLI PRO FOAM FOOTBED: Removable sockliner with a compression set which is less than 5% over time so the cushioning and fit do not change inside the shoe providing maximum comfort and energy transfer every time the shoe is worn. Outsole: SPEEDBASE TPU OUTSOLE: New injected TPU outsole is lighter thinner and stronger. The SPEEDBASE technology creates a lightweight and stable functional base for explosive movements required at top level cricket. Outsole: Supplied with spikes and soft spikes.